This is a great place to have some summer fun and especially so with small ones! I had always imagined the dark water to be fathoms deep but in fact, the bottom depth of the lagoon is only 3ft deep – making it a safe haven for small ones and learner kayakers! At the Lagoon Activity Centre, you can hire paddle boats, canoes and row boats by the hour. All safety precautions are in place including life jackets and a supposed “rescue boat” which thankfully, we didn’t need the use for. Although I must admit, I didn’t realise how unfit I am and after being the chief peddler on a pedal boat with three small passengers, my legs were like jelly and I would have welcomed a tow-in! There is an on-site cafe and a deck from which you can enjoy a cuppa whilst watching others paddle about on the water. There is also a playground nearby. Visit their website at http://www.lagoonactivitycentre.ie/ for further details or to make large group and birthday party bookings. 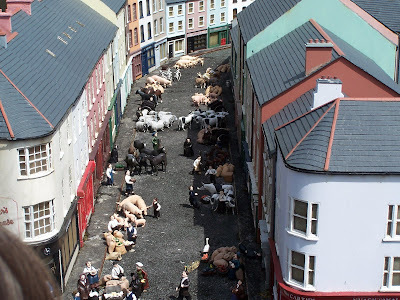 The Model Railway Village – a must for all ages in Clonakilty. The West Cork Model Railway village is a quaint miniature village where life in the 1940’s in West Cork is replicated on a scale of 1:24. 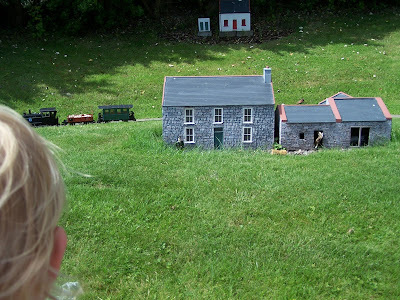 The Working replica of the West Cork Railway is superb as it chugs along from town to town passing farmlands, schools, agricultural markets and lakes all beautifully replicated in miniature. 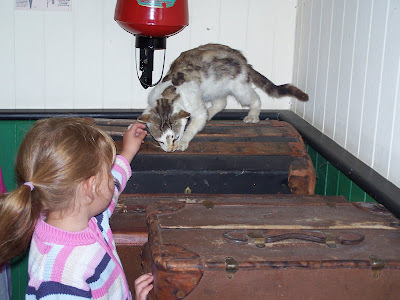 At the entrance there is a life size replica of a train station scene form the 1940’s complete with stuffed railway cat waiting to be petted on the leather luggage trunks. This sparked an impromptu lesson on the art of taxidermy which saw the kids skirting widely around the (plastic statue) of elderly lady passenger waiting on the platform near the cat, for her train! It was particularly interesting on one of the displays to note the live snail that had crawled there was almost the size of the houses bedroom window and it was certainly agreed upon that if snails grew to that size in real life, we would all be terrified! Also on site is a lovely tearoom and craft shop which are both housed in authentic train carriages and which lend a sense of occasion to both your snack and your souvenir shopping! There is a lovely picnic area outside with a couple of picnic benches looking out across Clonakilty Bay as well as an indoor playroom which proves to be extremely popular. An added bonus is that Birthday parties can now be booked and hosted at the Model Village and thanks to the great indoor facility, it makes it an all-weather sure-fire bet! 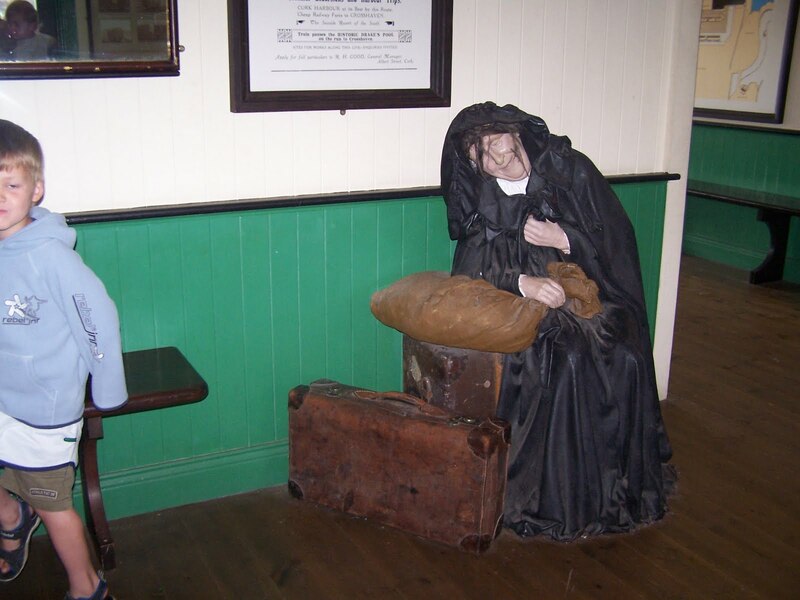 The Tschu Tschu road train departs from the West Cork Railway Village and gives a tour to Inchidoney beach or an informative tour through the town of Clonakilty itself, highlighting all the landmarks of the town. The Glengarriff Woods – Picnic Paradise with kids. The weather is so wonderful these past few days that it just begs for the picnic basket to be taken out for an airing and what better place to head than the Glengarriff Woods. There are several walks within the Glengarriff Nature reserve and all are clearly marked out along well maintained paths. 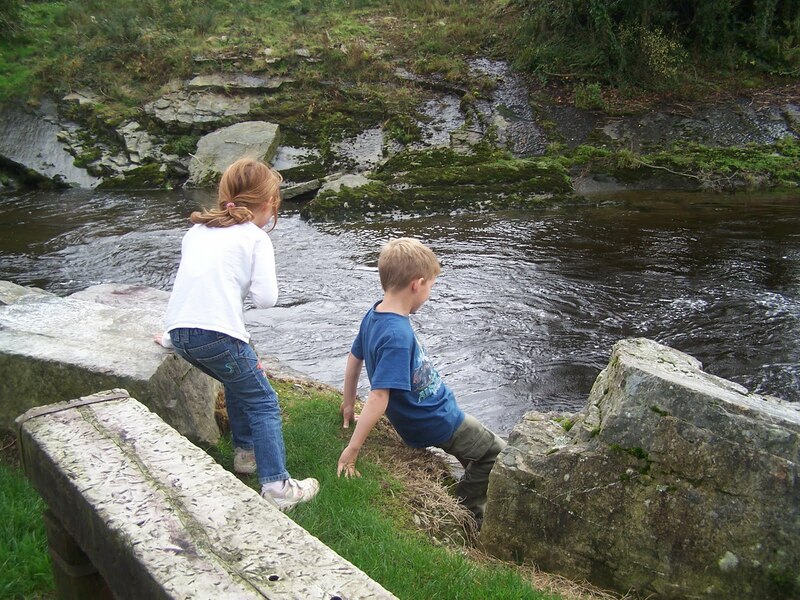 The River side walk is the most popular as it is an easy and gentle one kilometer loop stroll and is accessed right from the main car park – making it wonderful with toddlers and young walkers! The Glengarriff woods are one of the finest Sessile Oak woods in Ireland and is a firm favourite with both my children and with our house-guests. Oak has more animal species associated with it than with any other species of tree. Over two hundred species of insect live Oak trees. It is a credit to know that the mature oaks in Glengarriff host Ireland’s only arboreal ant species. These arboreal ant colonies are known to live in association with an individual tree for up to a century and by their very existence, demonstrate the ancient origins of the Glengarriff woods. There are numerous other walks available in the woods and a full colour leaflet is available from either the Tourist Offices in Glengarriff or from the leaflet box in the Nature Reserve car park. The walk up to Lady Bantry’s Lookout is steeper and tougher but well worth the view. Although it is quite a climb, the walk is possible with small children if you allow them to set their pace at the start. I always find that the coming back down is harder as they seem to gain an alarming amount of momentum and want to run! The Big Meadow walk is lovely and easy with no strenuous climbing but at three and a half kilometers can be a bit long for shortest legs in the group. When we first did this walk it was in winter and we encountered cattle grazing in the meadow we were to cross and were terrified we were putting ourselves in the path of a dangerous bull. I have subsequently found out that the meadow is an area of very old grassland that has not been fertilized or ploughed in living memory. In summer it is a profusion of wildflowers and in winter, a small herd of indigenous Kerry cattle graze the land to protect the grassland from invading scrub. Another very interesting fact about the meadow is that because of the lack of fertilizer and of ploughing, numerous ant colonies and ant hills thrive undisturbed in the grassland. For a quick walk to a beautiful picnic spot, The Waterfall Walk is a must. This walk is very impressive after rain when the little tributary, the Canrooska River is bulging down to meet the Glengarriff River. In the guide, the walk is labelled as easy and only half a kilometer in distance. We saw our first even Pine Martin (or “Tree Cat”) on this walk and have wanted to see another one ever since. Glengarriff woods have a wonderful range of fauna. The woods are the only place aside from Kerry, where one can be lucky enough to see the famous, Kerry Slug. This slug as been described as the aristocrat of slugs because of its unusual markings. You will know the slug by its distinctive black colour with white spots. The rare kingfisher bird with its vibrant colours can also be spotted here if you are very lucky. The Troll under the bridge at the main carpark! ﻿We have often had impromptu swims in the Glengarriff River; it happens as a gradual progression from skimming stones, getting splashed, getting wetter, paddling, swimming, stripping down then hoping for that spare change of clothes in the car has almost become a ritual now. The rivers in the reserve should be mentioned at this point as they support Ireland longest living animal; the freshwater pearl mussel which lives to be a staggering one hundred and thirty years old. The larvae of the mussels attach themselves to the gills of salmonid species of fish. After several months, they drop off and settle within the gravel beds there the mussels develop to maturity. Other mammals present in the Reserve include fox, badger, Sika deer, feral goats, hare, hedgehog, wood mouse and bank vole. Just yesterday someone was asking me all about Carriganass Castle – here is something I wrote a while ago about it, but it is still valid. The castle cafe is open from May to September but you can visit and soak up the wonderful atmosphere of the river at any time. Visit their website at http://www.carriganass.com/ for more information and for extra photos. The word Carriganass in Irish means the Rock of the Waterfall and judging by the position of the castle on its forty foot outcrop of rock over the river, the name is very apt. The Castle was built by an O’Sullivan Beare chieftain in 1540 and comprises of an imposing five-storey tower and a walled courtyard. The stone used to build Carriganass came from a local quarry about two miles away from the castle site and the stone was transported hand-to-hand by labourers for the distance of the two miles. The Chieftain responsible for the building became known as Dermot of the Powder as he accidentally blew himself up with gunpowder in 1549, just nine years after the building of the castle. Donal Cam O’Sullivan Beare was the most famous occupant of Carriganass. Donal Cam had a long military history and in 1601, he commanded the Munster forces on the Spanish side at the Battle of Kinsale. 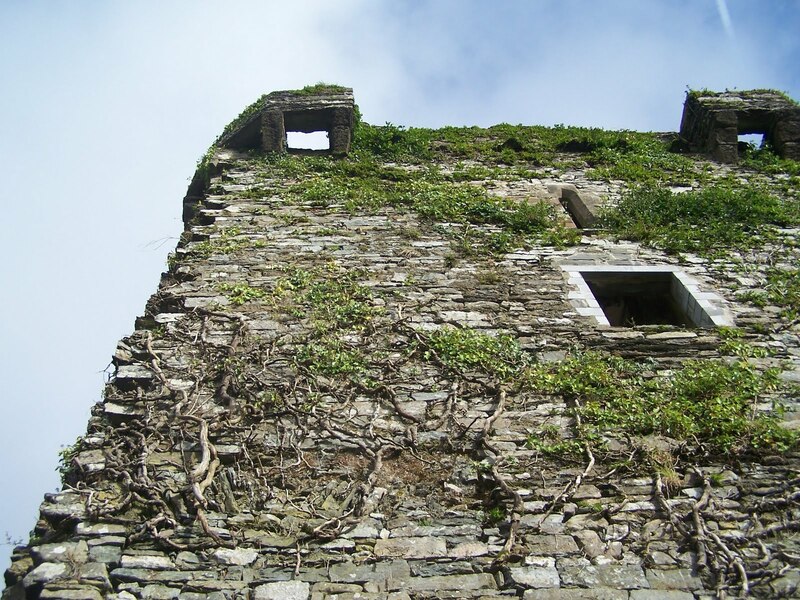 According to local folklore after Carriganass Castle was captured, Donal Cam’s wife, Aoife, fled to Gouganne Barra where she went into hiding. An English Military man named St. Ledger found her there and murdered her. Donal Cam gained access to Carriganass Castle by disguising himself as a monk and in revenge, he tossed St. Ledger to his death from the tower into the rocky torrents of the Ouvane River. A poem called “The Revenge of Donal Cam” was written as an ode to his vengeance. 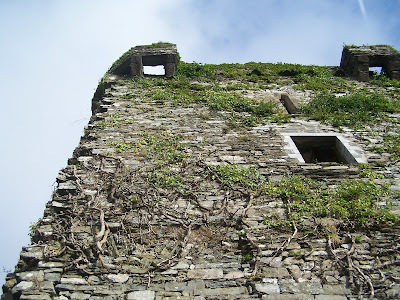 Other interesting facts about Carriganass castle is that the upper floor of the bastion is covered with tiers of “small rectangular niches” which would originally have served as nesting boxes. This level of the castle would have been used as a dove cote offering an insight and an indication into the diet of the inhabitants at the time. An aspect most appealing to gory children is the fact that the mortar used to hold the stones of the Castle together was made up of a paste consisting of bulls blood! Very impressively, Carriganass Castle is completely a community owned and managed asset, making it one of the very few castles in Ireland to have that status. 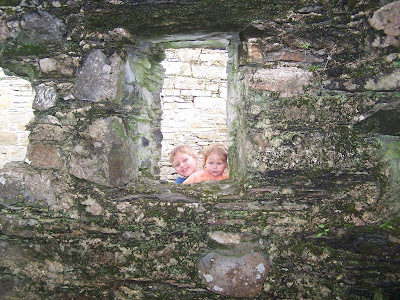 The previous owners, Anne and Joe O’Sullivan, generously donated the castle to the community which set up a non-profit, community-based company called Carriganass Castle Limited which now owns and manages the castle and amenity park in trust for the people. The work undertaken is done by a dedicated core of community volunteers who are constantly striving to improve the site by developing riverbank amenity parks and picnic areas around the castle, maintaining pathways, promoting tourism in the three valleys (Borlin, Mealagh and Kealkill) with Carriganass as the focal point, developing cycle routes and walkways linking with other significant sites in the area and creating an area for exhibiting local arts and crafts. There are currently three established walks leading from the castle. Two of the walks are circular walks (the “Poc An Tairbh Loop” and the “Sron na Gaoithe Loopwalk”) to the North of the castle while the third walk leaves from the castle and leads to the Stone Circle south of the village of Kealkill. The website, http://www.carriganass.com/ is loaded with information about the history and folklore surrounding the Carriganass. There are also detailed descriptions (with interesting historical insights) giving directions and estimated walking times of the above mentioned walks to be found on the extensive and informative website. I drive past this monument daily and although I have always had a vague idea of the story behind the man, it wasnt until recently I learned something shocking about him that really grabbed my attention and I suddenly had an urge to know more about him. Did you know, that this poor man lost not one, not two but FOUR of his children ON THE SAME DAY – to the same disease. I found that so appalling and so heartbreaking that I immediately wondered about him, about his life and what he must have endured. – the man who saved Irish Music. Captain Francis O’Neill, who not only gained admiration for being nominated as Chief of Police for Chicago city but also for his remarkable and invaluable contribution to traditional Irish music, was born in rural West Cork during 1848. It is said by Richard Jones, music librarian at the University Of Notre Dame that “without him, the music would have died or it would have gotten changed so much the original would never have been remembered”. Portion of the Plaque at Tralibane Bridge. He attended primary school at Dromore National School, before moving to school in Bantry where he made a positive impression on all this teachers and was made “school monitor,” a role which would have eventually led to a full-time career as a school teacher. However, at the tender age of sixteen, Daniel ran away from home after an alleged dispute with a sibling. In Cork city, he got a job as a cabin boy on a vessel sailing for England and from there, found work on other ships which resulted in him spending several years at sea. During a voyage aboard the “Minnehaha” when Daniel was just 21 years old, he was shipwrecked in the South Pacific. A passing ship rescued him and eventually docked in San Francisco where it seems that Daniel changed his name to Francis. Francis did various jobs in America such as herding sheep in Nevada, teaching in Missouri, and as a sailor on the Great lakes, before joining the Chicago Police Force in 1873. O’Neills Homestead in Tralibane where he was born. In 1906, a year after his retirement, Francis travelled to Ireland with Ann and spent a lot of time visiting in the Munster area and renewing acquaintances with musicians whom he had met in Chicago. During his visit, he also made arrangements for the erection of a high Celtic Cross headstone to mark the graves of his parents in the Caheragh Cemetery. Today, there is a dedicated committee from the parish near O’Neill’s native home place of Tralibane, who have erected a life-size bronze monument depicting O’Neill playing a flute. They have also constructed a commemorative wall as well as a plaque at the Tralibane bridge. Every year, there is a mid-summer dance festival held at the monument as well as open-air Pattern Days to honour the man who saved Irish Music. A book by Nicholas Carolan about O’Neill is aptly titled “A harvest Saved”. A section of the Commemorative Wall.